Barack Obama got hit by the famous Google Bomb on Yahoo! 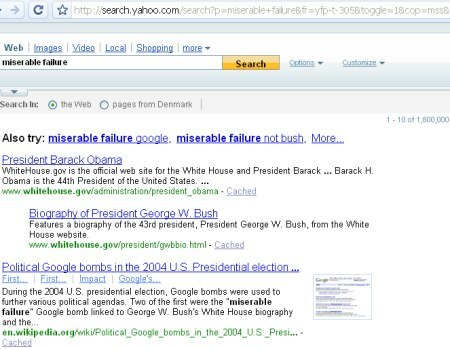 So Google did a couple of years ago “dismantle” the Google Bomb (the techique used) that got famous by hitting former president George W. Bush by making his White House biography number one ranking in Google on the search for “miserable failure”, but it seems like Yahoo! didn’t “dismantle” the Google Bomb on their search engine part…. and now president Barack Obama is number one of “miserable failure” at Yahoo! That’s a tough job not even finishing your first week at the White House and Yahoo! already “nominates” you as “miserable failure”…. Having only around 20% of the searches in US (opposed to Google’s 63%) does create some expectations, Yahoo! Barack Obama as “miserable failure” on Yahoo! And what about søgeoptimering – search optimization… I guess its about helping the ‘poor’ user of a search engine optimizing his search so he’ll find what he need… or?